Shay Olivarria with staff from the Free Library of Philadelphia. 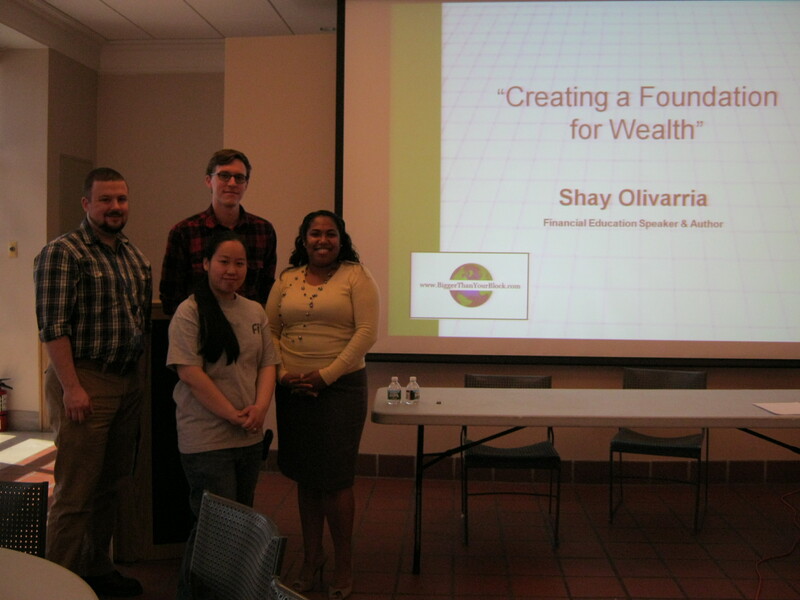 Thursday, April 5, 2012 Shay Olivarria was pleased to present financial education workshop “Creating a Foundation for Wealth” based on her book 10 Things College Students Need to Know About Money to student-workers at the Free Library of Philadelphia. Wow! The students were so much fun! We weren’t able to film because the students were minors, but there are some comments from the evaluation to give you an idea of how the workshop went. Book Shay to speak at your event today. This entry was posted in books, college, credit union, debt, events, family, general, investing, money, motivation and tagged author, creating a foundation for wealth, library, philadelphia, shay olivarria, speaker. Bookmark the permalink.